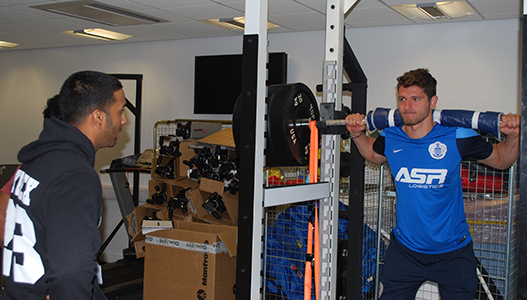 Strength and Conditioning students from Middlesex University were given the chance to put Queens Park Rangers players’ fitness to the test. Players from The Hoops' reserves and academy teams were put through their paces in April at the University's advanced sports facilities at Allianz Park, north London – also home to Saracens Rugby Club. 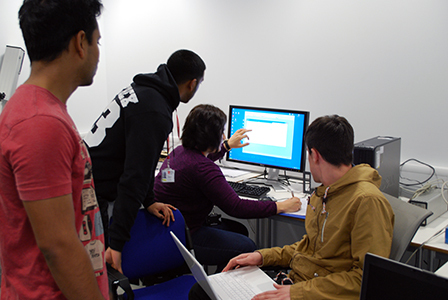 Students from the undergraduate and postgraduate courses recorded the players' fitness by analysing data following exercise, conducting background research and reporting the results back to them. Led by Senior Lecturer Anthony Turner and a team of Middlesex University strength and conditioning coaches, the students measured the players' speed, strength, agility and power, along with range of motion and body composition. The training helps identify each player's fitness levels, strengths and areas to work on, allowing them to refocus their work during training and enabling them to give a stronger performance and avoid injury. Anthony explained: "This research and testing is essential to the players' developments, and by incorporating students into the learning process, they are able to learn in a live situation and contextualise their lecture notes. "Getting real life experience working with elite athletes like this is extremely rare, and the students definitely seized the opportunity to demonstrate their experience and understanding." Sport and Exercise Science first year student Jess Huggins, who tested some of the players, said: "When we were at the stadium I felt right at home and in my element, like I was a professional sport and exercise scientist. Being able to test real athletes was one of my ambitions for when I came to this university." MSc Sport and Exercise Science (Physiology) student Shen Palihavadana continued his studies from an undergraduate degree to postgraduate level at Middlesex. He said: "In my first couple of years at Middlesex, we were given the chance to work with Birmingham City FC Academy players, so it's been great to carry this on into postgraduate level. "You gain so much more experience working with actual athletes in this way. It puts you ahead of the game, as well as giving you an extra qualification. It's also fantastic that we are based in the Saracen's rugby ground, away from a classroom environment." Scott Daly, Queens Park Rangers' Under-21s Strength & Conditioning Coach, said: "It's great to meet up with the staff at Middlesex University as we undergo physical testing in order to obtain detailed information on each of the players. "The information we collect is used to track any physical changes that occur throughout the season, as well as helping us to optimise individuals' programmes going forward. "Anthony and the rest of the staff and students are excellent in their support of the club and it's always a pleasure to work with them." Anthony added: "The players were really impressed by the students' expertise knowledge, and they certainly took on board the students' advice, which they will now take back to the pitch." Image caption - QPR U21s defender Jamie Sendles White tests his strength whilst Middlesex University students analyse the results.